TURIN -- Fiat CEO Sergio Marchionne sees 60,000 jobs in Italy's car industry at risk if the sector does not get help from the government. Marchionne made the comment in Turin before he went into a meeting of Unione Industriali, a regional association of industrialists. Asked by the reporters if he shared a union official's view that 60,000 jobs were at risk, Marchionne said: "This is a risk." Italian Prime Minister Silvio Berlusconi has called for a meeting on Wednesday with industry officials to discuss the crisis that has hit the auto industry as customers stop buying new cars during the economic crisis. In contrast with countries like France and Germany, Italy has yet to say how it will help its auto industry. 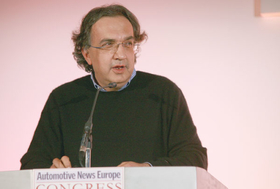 "We expect help from the government for the entire car sector," Marchionne told Italian news wires. "It's not about helping Fiat but restarting an entire sector and the whole economy." Last year, new-car sales in Italy fell 13.4 percent to 2.16 million. Automakers and analysts expect the Italian market to fall another 14 percent this year to 1,850,000 units. Figures from the Italian automaker association ANFIA suggest the Italian auto sector employs 275,000 people, of which about 75,000 work for the Fiat Group.